The Food Program is pleased to host Manon Tremblay for a workshop on pruning and grafting. Manon is a Certified Horticulturist (ITA) and Landscape Designer. She has been living on the West Coast for the past 16 years, and is passionate about edible and native gardens, organic and permaculture gardening, pruning, propagation, land reclamation and Ethnobotany. She works as a gardener, landscape designer, consultant and horticulture instructor. The workshop will cover basic pruning methods and their effect on plant growth and development, and an introduction to winter fruit tree pruning. In the morning, we will cover pruning theory, how to maintain healthy trees and enhance crop production. 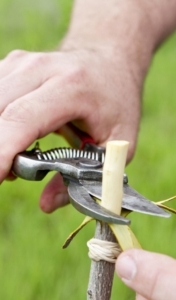 The afternoon will be a hands-on supervised pruning session where participants will practice their newly-acquired skills, and a grafting demonstration as well. Morning at the South Hall and afternoon at a mid-island orchard. Car-pooling will be organized. Please bring a bagged lunch. The Seed Library of Galiano is having its final lending session of the season this Saturday, April 16th from 12-2pm at the Galiano Community Library. Lifetime memberships are available to all residents of Galiano for $10. Come “check out” our seed inventory. 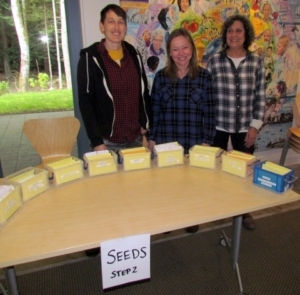 We’ll have a “check-in” party at the end of the growing season for people to “return” seeds back to the library. We welcome all levels of growers and encourage everyone to save seeds! View the attached PDF document to see what seeds are available from the Seed Library Inventory. Beyond SLOG’s inventory, also available Sat. April 16th, are various wildflowers, some herbs, and a few vegetable seeds, part of a give-away thanks to Eleanor Coulthard and Marilyn Lane. If you cannot attend SLOG’s library hours please contact Colleen at galianofoodprogram@gmail.com and special arrangements may be made.